that I LOVE...no adore...my coffee. but I do ENJOY a really good cup of coffee. friends at our weekly game night. A month or so ago, I served my esteemed panel of taste testers Gevalia's 1853 Heritage Blend coffee. I said nothing..and guess what? I got the most compliments I have ever had on the coffee that night. That was my little experiment! Of course I let them in on the secret...always happy to share something good, right! I am not a food blogger, so my words, as they pertain to food may be lacking...so I will just borrow the words from the experts at Gevalia. "1853 Heritage Blend is old-world coffee craftsmanship at it's best: not too dark, not too light. A sippable balance of full body, rich flavor & smooth acidity." On top of that "coffee yumminess," the medium roast has subtle undertones of caramel. Coffee and caramel...oh to sit on my deck and simply enjoy this treat! 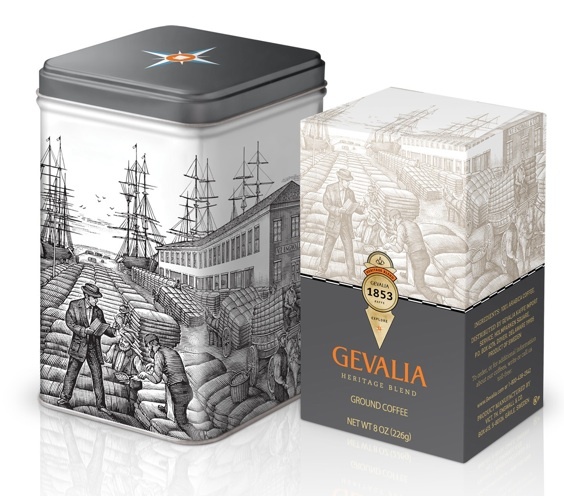 Gevalia's 1853 Heritage Blend was inspired by coffees procured 150 years ago in Sweden. This blend celebrate Gevalia's rich coffee history as well as the founder of Gevalia, Victor Theodore Engwall. Gevalia has a long history producing quality coffee and now offers over 40 varieties of coffee and tea! The amazing sip of coffee made from the 1853 Heritage Blend is available only once a year while supplies last - so see, it is really special coffee! And you know what else is really special...someone - oh no TWO OF YOU - right here can win some of this amazing coffee and a collectors tin! Wooo-whooo! Here is how to enter: THERE ARE 2 WINNERS! Giveaway open through Tuesday, August 30, 2011 at midnight PST. Your email must be linked in your profile or left in your comment. Go visit the Gevalia website and come back and tell me what flavor of coffee or tea you would like to try. Disclosure: I was provided Gevalia 1853 Heritage blend and a collector tin for review. The opinions are my own. No monetary compensation was received. Dark Chocolate Truffle, for me, Please! I would like to try their single bean Kenya Roast. I too can not survive with out my coffee! I am a KONA gal, have always loved it. I would die to try theirs! i would love to try the raspberry danish flavor! I would like to try the Stockholm Roast. I'd love to try the Chocolate Raspberry!! Yum! I follow Gevalia on twitter @allthngzrelated! I like Gevalia on FB! either Royal Vinter Spice or Raspberry Danish would be my first ones to try! Both sound yummy! I follow Gevalia on FB! The 1853 Heritage Blend and/or the Mocha. Dark chocolate truffle sounds incredible! Not sure why but it's not letting me post this with my google account!! I would love to try the Afternoon Revival. I would love to try their flavored coffees...Hazelnut, Cinnamon, Creme Brulee...they all sound superdelicious! Thanks! dark chocolate truffle for me!! num num! I Love Gevalia but haven't tried this blend. I used to order the cinnamon and I miss it! Hazelnut sounds yummy too!